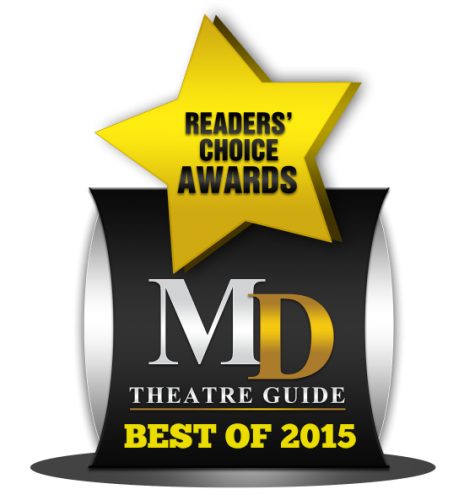 We are proud to announce the nominees for ‘Best Community Theatre’ as part of MD Theatre Guide’s Best of 2015 Readers’ Choice Awards! It is up to YOU, the reader to pick the winner! We have even included a special “other” box where you can fill in your own nominee, if your favorite organization is not listed. CLICK HERE to VOTE or scroll to bottom ballot. To vote, select your answer, then click “Submit.” (Only one vote will count per computer/mobile device.) We look forward to having you help us honor the best of 2015! VOTING ENDS MIDNIGHT, JANUARY 31st, 2016! The five nominees are listed in alphabetical order. Nominee #1: Port Tobacco Players. In the winter of 1947, in the drawing room of Stagg Hall, a plan was conceived to raise money to aid the Port Tobacco Restoration Society return their town to glory. This group of artists from Port Tobacco and nearby La Plata set out to bring to the stage entertainment that would provide enough profit to continue their endeavor and provide for their cause. PTP spent the next twenty or so years performing in high school auditoriums, court rooms, village greens… wherever anyone wanted to see a play. Their efforts paid off and the courthouse was restored. In 1974 a permanent home was found – a 1940’s movie theater owned by a local pharmacist was the ideal spot to begin a new era. From those days, we have evolved into what we are today: a cultural staple in Charles County’s historic landscape. Today PTP performs six shows per season on our recently renovated main stage in downtown La Plata and also performs countless road productions with their Encore and Encore Kids touring companies. The Port Tobacco Players are dedicated to continuing the tradition of providing quality theater to the citizens of Southern Maryland. 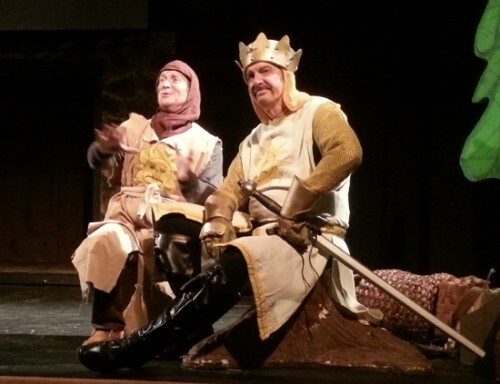 The cast of ‘Spamalot.’ Photo courtesy of Port Tobacco Players. Nominee #2: 2nd Star Productions. 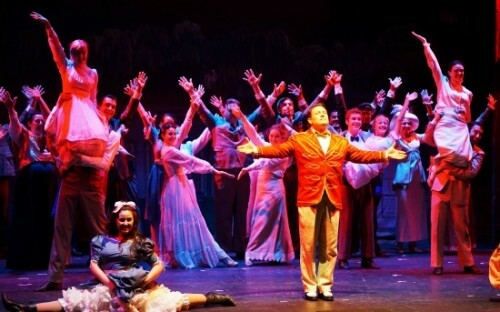 2nd Star Productions presents two musicals and one comedy each season at the Bowie Playhouse. 2nd Star Productions was founded in January 1996 by Jane Wingard, John Guyton and Gordon Gustin – a theatrically experienced trio who decided to “make their own rules for the sandbox.” In addition to producing high quality shows, they wanted to create an atmosphere where people can grow, have fun and feel that their contributions were highly valued. The current musical director and conductor for all productions is Joe Biddle. The resident director is Jane B. Wingard. Guest directors have included Braxton J. Peters, who has a long professional resume and is Artistic Director for the Annapolis Opera, and the late Bobbi Smith, whose directorial work included hundreds of productions on the East coast and who worked as Staff Director / Choreographer for ten years at Burn Brae Dinner Theater, and most recently, Charles W. Maloney. Professor Harold Hill (Lee Nicol) stands with the townspeople of River City, Iowa, at the completion of the amazing score, “Seventy-Six Trombones.” Photo courtesy of 2nd Star Productions. Silhouette Stages started life as Shadow Block Productions in May 2003 with a production of “Quilters,” an unconventional, vignette-based musical about frontier women. The name “Shadow Block” actually referred to the blocks individually sewn into the quilts. At that time, the goal of Shadow Block was to produce rarely seen, small-cast musicals – the “hidden gems” of Broadway and Off-Broadway. Over the next five years, Shadow Block shows ranged from the serious, Violet and Working, to the seriously funny, Lucky Stiff, Johnny Guitar, and Is There Life After High School, to the satiric Ruthless, Nunsense and Nunsensations. Having relocated to Slayton House in the Wilde Lake Village Center of Columbia, MD in 2008, the first season’s offerings included the familiar, You’re A Good Man, Charlie Brown and Rock & Roll Review, as well as the peculiar and very funny, A Funny Thing Happened on the Way to the Forum and Sugar. The group formed a new Board of Directors, incorporated and officially re-named themselves as “Silhouette Stages” in fall of 2009. 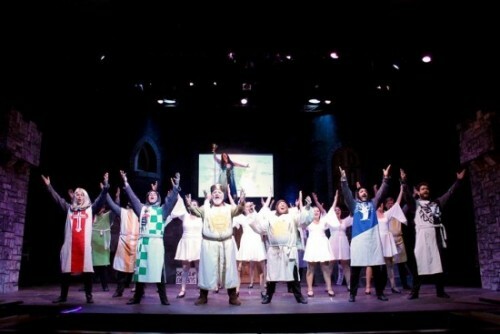 Each season’s offerings will include a mix of big-name musicals, straight plays/comedies, and the obscure gems. Silhouette Stages touches an ever-expanding community of actors, musicians, production and technical crew, and creative staff in its mission to bring audiences the joys of the theatre experience. Nominee #4: Silver Spring Stage. Silver Spring Stage is an all-volunteer community theater that puts on some of the best community theater in the Washington, DC area. With over 40 years of innovative work, Silver Spring Stage is ranked as one of the top theaters in the region. Jeff Breslow, Julia Morrissey, Noah Rich, Caity Brown. “America’s Oldest Little Theatre” – The Vagabond Players. The Vagabond Players was established in 1916 during the popular “Little Theatre Movement” and quickly established itself as an important part of theatre history. We are in our 100th season of continuously operating theatre here in Baltimore. The first play produced by Vagabonds was an original piece submitted by H.L. Mencken The Artist. Vagabonds proceeded to encourage and produce the writings of a young and at the time, unknown Eugene O’Neill, as well as Arthur Schnitzler, and introducing to Baltimore new works by August Strindberg and Maurice Maeterlinck. During the 1920’s this ‘Little Theatre’ held fast to its amateur status despite Governor Ritchie and Mayor Broening urging the group to turn professional. Thus The Vagabond Players outlived The Provincetown Playhouse in Massachusetts and The Neighborhood Playhouse in New York, both of which were Little Theatres that turned professional and shortly there after dissolved. 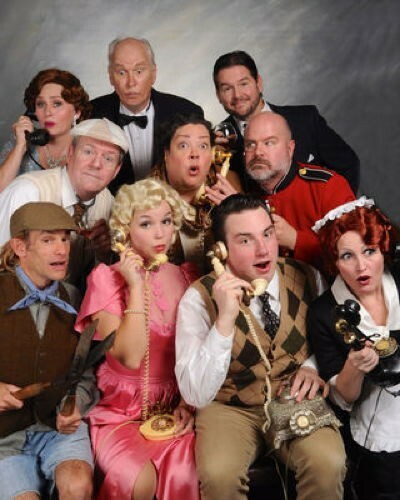 Cast of ‘Something’s Afoot.’ Front Row: Gary Dieter, Amanda Dickson, Thomas Gardner, Tammy Oppel. Middle Row: Mike Ware, Jane C. Boyle, Steve Antonsen. Back Row: Elton Knupp, Tim Evans, Dean Allen Davis. Photo by Tom Lauer. 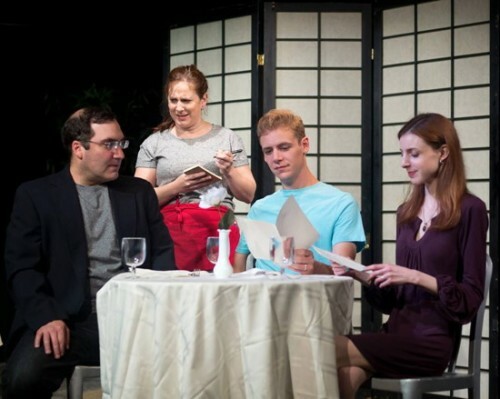 Annapolis Summer Garden Theatre, Milburn Stone Theatre, Kensington Arts Theatre, and Dundalk Community Theatre. *Photos/Info. provided by the organizations websites.